Longboards have been around for about 40 years or more. What can be confirmed though, is that they first gained popularity in the late 70s when a small group of longboarders got honored by SkateBoarder magazine in 1978. Tom Sims and Brad Stradlund promoted longboarding as a form of self-expression. It is said that they were largely influenced by surfing. At the time, longboarding was kind of an underground sport and did not get prominent recognition. But in the early 1990s, Sector 9 started mass producing and selling longboards. I think none of these guys at that time could have imagined that someday longboards would become electrical and we wouldn’t have to ride them like they were ridden in the 70s. An electric longboard is a modified longboard that is propelled by an electric engine. The thrust of which is usually controlled with an RF remote. As with a regular board, it is steered with the riders shift his weight. It was originally designed for local transport, but with the advent of more serious off-road models, it is quickly emerging as a new thrill sport. Offroad style boards are able to traverse grass, gravel, dirt, and hard sand. In the late 1990s, a guy named Luie Finkle, aka Electric Luie, invented and patented the wireless electric skateboard. From handmade electronics and a 100% original brushed motor design to the world’s first torsion trucks – Louie made the first revolutionary electric board. Back then, most things electrical had cords, and lithium battery technology was still in its infancy. Louie combined wireless technology, speed, and power with stability and reliability to make Exkate. The world of electric longboards has evolved into a huge market where most options are available for the same price. The problem buyers today have is choosing the board that’s best for them. We’ve compiled a list of the best riding boards you can choose from for your ease. Navigate the streets with confidence and style with this electric board with a remote. With this longboard skateboard, you can reach a maximum speed of 17 miles per hour. It has a range of 6 to 8 miles once it’s fully charged. It is equipped with a 36V, 4.0Ah lithium-ion battery pack (battery included) that can be fully charged within 3 hours. A wireless remote controls acceleration and deceleration. What’s more, it comes with a reverse capability. The deck is made of 7-ply maple wood and two layers of bamboo at the bottom. This layered construction gives the deck sturdiness and flexibility. The longboard deck is outfitted with grip tape so you can have your feet firmly in place. The BLITZART Huracane is equipped with a 350-watt motor with regenerative braking. These boards use reliable hub motors. This electric longboard comes fully assembled. You can ride it instantly out of the box. This is our choice for the best budget electric longboard. The Fitnessclub electric longboard is powered by two 350-watt hub motors, helping you achieve a top speed of 22 miles per hour. There are two-speed modes. Meanwhile, the 36V, 400mAh lithium-ion battery can provide a range of 9 to 13 miles. Charging is fast; the battery will be fully charged in just 2 hours. The rechargeable wireless remote allows you to control the throttle, brake, speed switching. 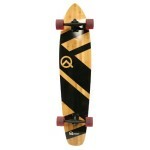 The deck is made from Canadian maple wood, is 36 inches long and weighs 13 pounds. It can support a maximum weight of 220 pounds. If you are searching for the best affordable electric longboard, this one is for you. The Evolve One has a powerful 2000-watt brushless outrunner motor that provides smooth acceleration and braking. It has 4-speed modes (GT, Fast, Eco and Slow). Achiever a top speed of 22 miles per hour (may vary depending on terrain and the rider’s weight). The lithium ion battery can give you up to 21 miles of range on a single charge. Meanwhile, the Super Carve Truck system provides stability and allow you to perform tight turns. When it comes to climbing ability, you can conquer hills up to 20% gradient. The remote controls acceleration and braking. The LCD screen gives real-time data such as speed, distance, as well as board diagnostics. 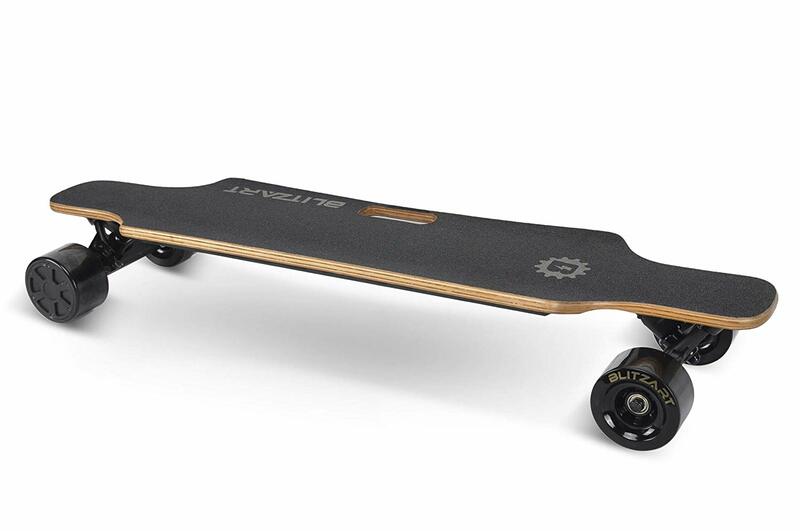 The BACKFIRE G2S is equipped with two 300w in-hub motors and a 36V, 5Ah lithium-ion battery. This electric longboard has a top speed of 23 miles per hour and can travel 12 miles on a single charge on Sports Mode and 15 miles on Eco Mode. Charging time takes about 3.5 hours. The G2S has a flexible deck that absorbs shock and vibration when riding. Meanwhile, Caliber II 50-degree trucks provide great carving performance and stability during high-speed riding. The board weighs 14 pounds and is easy to carry. This might just be the best buy electric longboard for you. To get your money’s worth, choosing the best electric longboard from a reputable brand is essential. 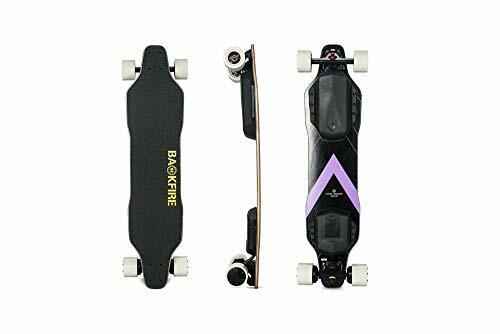 Reputable electric longboard manufacturers are willing to answer your questions, offer a warranty, and ensure replacement parts are available should any of the components malfunction. Take note that electric longboards are more expensive than regular longboards. 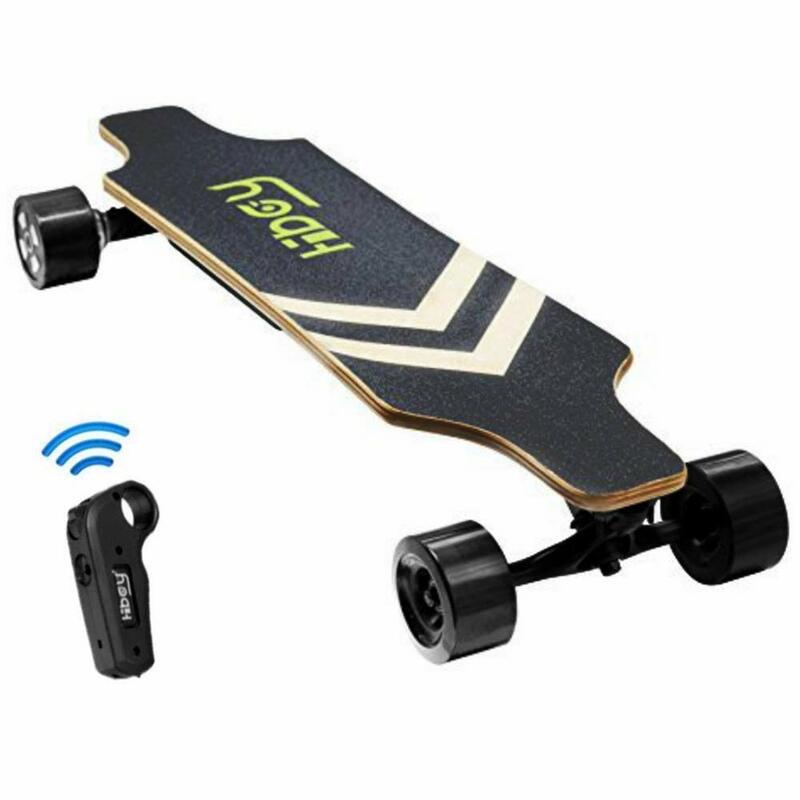 The reason: an electric board has an electric motor, battery, remote control and receiver, and electronic speed control (ESC). These components are the main reason why electric longboards cost 5 times more than regular boards. Most electric longboards are capable of reaching a speed of at least 20 miles per hour. Some high-performance models can achieve 24 to 26 miles per hour. There are two things to remember when it comes to electric longboard speed. First, higher speeds mean an increased risk of injury if you fall or crash (especially if you are not wearing proper protection). Second, operating at maximum speed isn’t that efficient because it will drain the battery faster. The range of an electric longboard determines how far one can travel on a single charge. 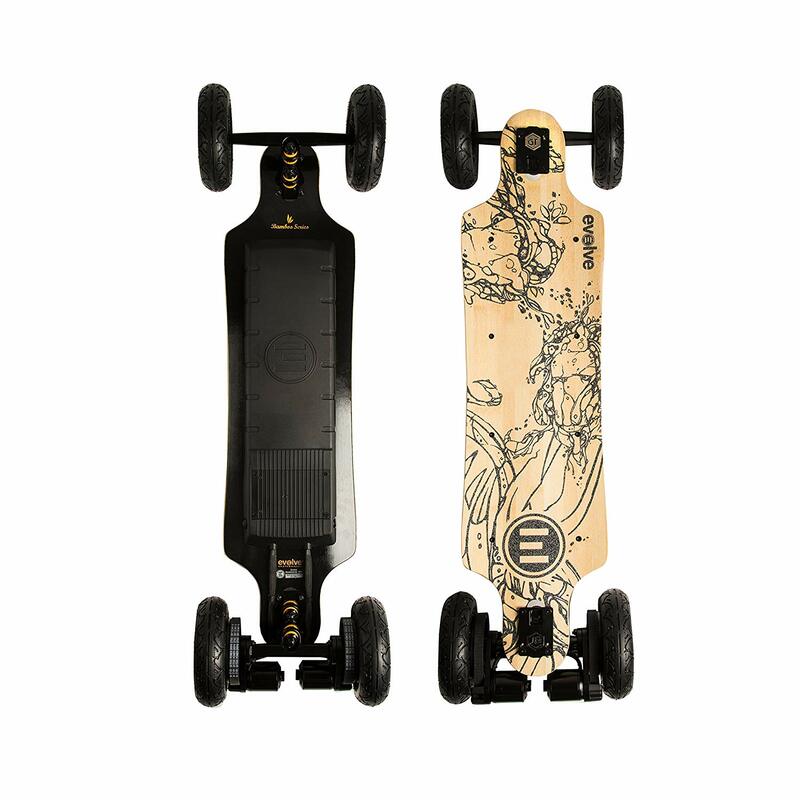 A range can vary greatly among electric longboard brands (anywhere from 6 to 20 miles on a single charge). Some brands allow a rider to change the battery without using any tools. In general, electric longboards with a drained battery can be ridden like a standard longboard, although you may need to exert extra effort to do so. Electric longboard motors come in all shapes and sizes. The best motor for electric longboard is the brushless DC outrunner type. This motor provides plenty of power and torque. Motors have a Kv rating of 170 to 245 and watts from 1500 to 3000. The Kv rating denotes how much torque a board has while watts refer to how much power the motor has. Generally speaking, the higher the watts, the better. Li-ion, LiPo, and LiFePo4 are three types of batteries that are commonly used on electric skateboards and longboards. A Li-ion or lithium-ion battery is what most electric longboard manufacturers are using right now. Lithium-ion batteries have a longer lifecycle, easier to handle, and safer than the other types of batteries. LiPo (lithium polymer) batteries are cheaper and have less voltage sag. However, they are less safe when compared to lithium-ion batteries. They also have a shorter life cycle compared to a Li-ion or LiFePo4 battery. LiFePo4 (lithium iron phosphate) is a new battery technology that offers the power of a LiPo and the life cycle and safety of a Li-ion. But they are expensive to produce and can’t be sourced easily. An electric longboard deck is made of wood or composite material. The deck either has a flex or stiff feel to it. A flex deck absorbs small bumps in the pavement, keeping you comfortable while riding at high speeds or uneven terrain. 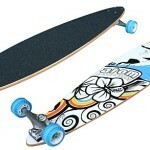 Meanwhile, a stiff deck is more suitable for maneuvering at high speed and better control of the longboard. However, it is less stable in a sense that it doesn’t absorb bumps and uneven surfaces that well. 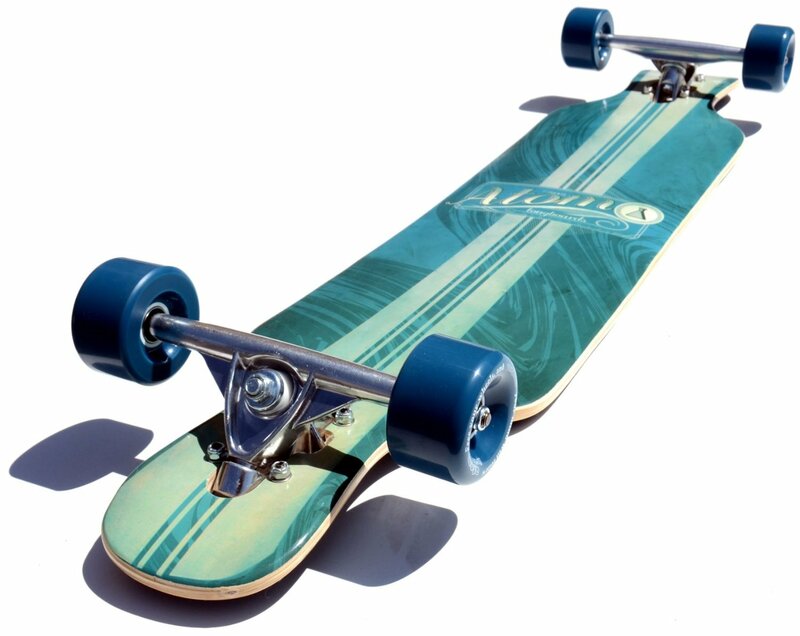 The size of the longboard wheels will affect the overall performance of the board. Larger wheels offer a smoother ride and higher top speeds. On the other hand, smaller wheels will give you faster acceleration and improve how tight you can turn. Measured in inches, this signifies how long an electric longboard is. No specific length delineates longboards from skateboards. Some say it should be 36 inches, while Wikipedia says it is 33 inches. But generally speaking, longboards are 33 to 59 inches in length (as opposed to skateboards which are between 28 and 33 inches long). Expressed in pounds, weight pertains to how heavy a board is. This factor comes into play when you have to carry the board when not in use. A concept adopted from electric cars, regenerative braking is a technology wherein energy can be recovered thru a mechanism that slows the board while converting the energy to a form that can be stored within the battery for future use. To put it simply, every time the rider hits the brakes, the board’s battery is slowly recharged. While it’s true that the recharge from operating the brakes is minimal, it’s still a useful feature to increase range out of your board. The max incline is how steep an electric longboard can climb (measured in percent grade). If you’re planning to use the board in a hilly area, this factor is of great importance. For flatter areas, this is not too significant. Whatever the case, it’s still better to have a board that can adapt to different conditions. Is It Safe to Ride an Electric Longboard? One of the major differences between an electric longboard and a regular longboard is braking. Different models may have different braking systems. But in general, you can activate the brakes by doing the following: First, let go of the throttle. Then, pull back the throttle gently and gradually to stop the board. Important: don’t pull the back the throttle to the bottom abruptly. This is because when the board is moving at full speed, there’s a considerable force going forward. If you brake abruptly, the board will stop immediately. If this happens, you’re likely to be thrown off the longboard. But if you follow the braking process correctly, you’ll be good. That said, you should still wear protective gear. The most important safety gear to wear is the helmet, as it provides head protection in case of a crash or fall. Meanwhile, elbow and knee pads will help prevent injury to those areas. Slide gloves are also recommended. In the event you want to ride during the evening (not advisable though), it’s best to have some LEDs for your headgear and board. Also, wearing high visibility clothing will make it easier for motorists to see you. Electric longboards are becoming more and more popular in our society because more and more people see them as a great way to travel across the city. If you love riding your board, but might find it too exhausting to take to work then electric boards are perfect for you. Of course, it is much more expensive than a regular one, but it will give you the freedom you need when riding it.